Gusty winds will remain in parts of San Diego County and could make driving difficult until Wednesday afternoon. 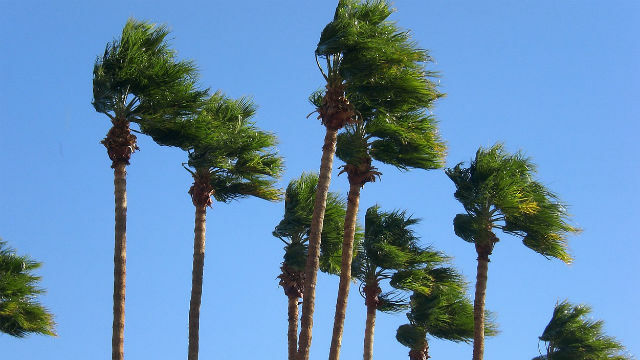 The National Weather Service office in San Diego issued a wind advisory that will expire at noon Wednesday for the mountains and inland-valley areas. A wind advisory signifies that sustained winds of at least 35 mph are expected, the weather service said. Northeast winds Wednesday will range from 15 to 25 mph with gusts up to 45 mph possible from mountain ridgetops to the inland valleys, forecasters said. Powerful winds could whip up sand and dust and create potentially hazardous driving conditions, especially for high-profile vehicles, the weather service said. Officials urged drivers to be cautious in low-visibility areas and look out for possible downed trees and power lines. Strong winds may have caused a roughly 75-foot-tall tree to fall onto a two-story house in the Point Loma Heights area Monday morning, killing a North Dakota couple that was staying in the vacation rental. Accompanying the strong winds Wednesday will be mostly sunny skies and above-average temperatures. High temperatures Wednesday will be 66 to 71 degrees at the beaches and inland, 68 to 73 in the western valleys, 58 to 66 in the mountains and 67 in the deserts.